You can probably recall a handful of moments when you are in complete awe of something you witnessed or a person who held you in wonder and amazement. My husband Tim and I were recently privileged to such an occasion. Sunday, November 17 was the date and Tempe, Arizona the location. It all began at 6:30 a.m. as the Cedar Springs resident, Chris Mabie, prepared to enter the 65-degree water of Tempe Town Lake as the first leg of the grueling Ironman competition. This 140.6 mile (a comparable distance from Cedar Springs to Northern Detroit) triathlon is considered the ultimate challenge of body, mind, and spirit. The past 12 months have required Mabie, a wife, mother, and grandmother, to spend 4–5 hours a day 6 days a week in extensive training. At first glance, this attractive 5-foot 3-inch, 112-pound lady may not appear capable of such an extreme feat. However, the passing of her father, Jim Swanlund, in 2012 inspired Chris to bring awareness to Lewy Body Dementia (LBD). Jim was a warrior during his two-year battle with LBD. The disease is the second most common type of progressive dementia after Alzheimer’s disease, causing a progressive decline in mental abilities and ultimately death. To date, over $3,000 has been raised through Chris’s race. You can learn more about the LBD by visiting www.FirstGiving.com/fundraiser/ChristinaMabie/IronmanArizona or you can send a check directly to Chris Mabie and she will forward it to the fund. Competitors must meet the individual event cut-off times and ultimately complete the race within 17 hours from the official start. Only 3,000 entrees were allowed at the Arizona Ironman with all slots being filled within 40 seconds after it opened online, one year prior to the race date. Other entry requirements include work experience at an Ironman event. This year’s Arizona race included athletes from 36 countries and every state in our nation. One lady completed her 51st Ironman event while another man in his 80’s joined the race. The race day gun fired at 6:50 a.m. for the approximate 30 professional level triathletes and the remaining 2,707 started at 7 a.m. after entering the water in preparation for the 2.4-mile swim. This is always the most dangerous scene as swimmers spar for space and air. The black wetsuits with arms completing circular movements in the water reminded me of a massive school of flying fish. Chris described the swim as “brutal.” She finished this first leg in 1 hour, 22 minutes, and 17 seconds landing her in 24th position within her rank (females 50-54). Upon exiting the water, she quickly entered a tent to remove the wet suit and jump into appropriate clothing for the next leg. With the clock ticking, athletes must find their bike, helmet, fluids, and food for next several hours. Chris knew she must consume about 300 calories an hour along with adequate water to keep her body expelling the level of energy required. As her husband Tim, mom, mother-in-law, sisters and their families, along with Tim and I, stood waiting at the bike shoot to shout a few encouraging words, Chris found us and started shouting “Hi!” with a big smile on her face, waved, and then picked up her speed. I felt exhausted just from watching her swim! Chris on the other hand looked alive and excited for her upcoming 112-mile bike adventure through the Sonoran Desert. Mabie Fans positioned themselves at various spots for a quick glimpse of Chris along the limited viewing areas of the bike trail. She finished this leg in 6 hours, 6 minutes,, and 13 seconds at an average speed of 18.35/miles per hour which moved her up to finishing that leg in 19th within her rank. The third and final leg mandates a full marathon or 26.2 miles on foot! Yes, a full marathon! Just try to imagine this after swimming 2.4 miles and biking 112 miles! The same transition site was used for the swim to bike also allows for the bike to be parked, shoes changed, and a starting point for the run. Chris was given encouragement from short spurts of communication with her hubby and family along with posters made by friends from back home held up for Chris to see. The race was broadcast live online allowing friends and family to follow Chris every step of the way and to include a full visual view at the finish line. Temperatures did drop as the sun went down and the excitement of another “Chris sighting” held us captive. We all knew she was doing better than her estimated times. And then, out of the darkness and around the last bend, we saw our “Cedar Springs Wonder Woman” rounding the 25-mile marker. She had been averaging a running speed of 9.47 minute miles. She finished the footrace in 4 hours, 16 minutes, and 33 seconds. 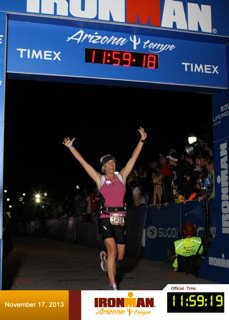 She had finished this Ironman under 12 hours or to be exact … 11 hours 59 minutes, and 18 seconds. She finished 11th in her rank of 89, 162 of the 745 women in the race, and 862 of the 2,707 total women and men triathletes. Impressive to say the least! With her father’s legacy in her heart and surrounded by her family, Chris finished the race standing strong and beaming with joy. I stood there looking at her in total amazement wondering, “How in the world did she do this?” She gave out hugs to all her supporters and then asked, “Want to go get a burger and drink?” I am thinking to myself, shouldn’t she go back to her room, lay down for few minutes, and just rest? But no, we gladly followed her and heard some funny stories of her day. Ironman Chris Mabie, you are an inspiration and an example of what can be done through hard work, dedication, and believing. Thank you for providing me with what I consider a miraculous occurrence. Your courage is encouraging! You are one of those “Life-Enhancer” as described by Walt Disney. You dared to explore your potential and not be controlled by doubt or fear. You implemented and executed a well-defined plan and succeeded. You allowed yourself to be all that you were intended to be. Yet, through it all you remain humble. Chris Mabie, you are amazing! Congratulations on your new title of Ironman! Does this give Cedar Springs our one and only Ironman? What a beautifully written account of Chris’s Ironman feat!